Lim Ching Yeong achieved the highest ATAR of 97.05 with distinctions in all the subjects she studied. She intends to pursue medical studies at a local university. Stanley Wong Xiang Yong and Lee Shan Neng achieved ATARs of 95.95 and 95.75 respectively to be in second and third positions at IICP. 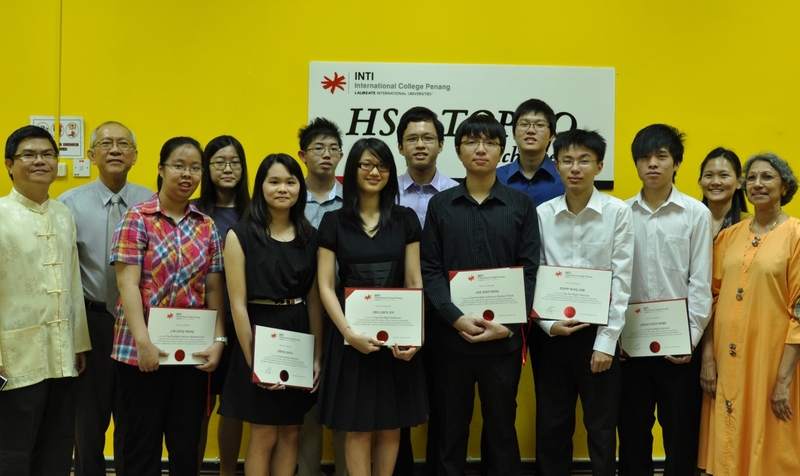 Lim Ching Yeong (3rd from left), Stanley Wong (6th from left) and Lee Shan Neng (6th from right) with other NSW HSC high achievers and members of IICP’s management and faculty. “NSW HSC is a fast-track course offering holistic education. The fantastic track record created by IICP’s stellar students past and present accentuates the high credibility of the course. Being the backbone of INTI’s consecutive achievements, the lecturers here are easily approachable and have never faltered in gearing students for success,” said Stanley, who has set his sights on ACCA qualification. A total of 35 high distinctions and 149 distinctions in various subjects were obtained by the students. 20 students obtained 5 As in the subjects they took. In 7 subjects (Business Studies, Biology, Chemistry, English as a Second Language, Information Processes & Technology, Physics and Mathematics), IICP students achieved higher pass rates than that of the world. Entry into universities depends on the ATAR, a measure of the student’s overall performance in comparison with all students taking the NSW HSC. Comparable with the A Level, NSW HSC can be completed in 11 months. At IICP, a wide range of subjects is available in the sciences and commerce, and students may combine subjects from the two for broader options in tertiary studies.